San Diego’s First Invitational “Jantastic” Makes History! 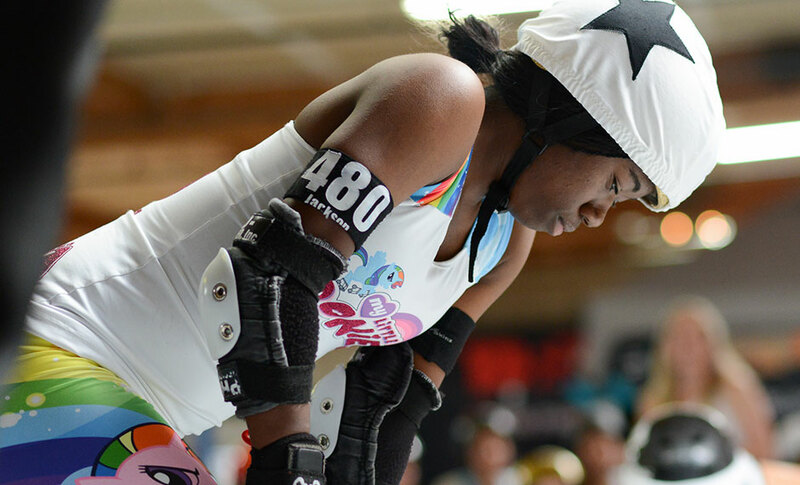 A huge step forward was made in banked track roller derby a few weekends ago in San Diego. The first annual Jantastic Invitational Tournament was held at the Dollhouse and all-star skaters, from both flat and banked track roller derby, joined together to assemble some of the finest teams to battle it out on the banked track. The event was a huge success and proved that the banked track continues to attract both fans and skaters alike. The tournament started off on Saturday, January 17th, with two pools of teams battling it out for a place in the semi-finals on Sunday. By the end of day one, the rankings in pool 1 were My Little Ponies with 2 wins, Atom All Stars with 1 win & 1 loss and The Rejects with 2 losses. Pool two rankings were RDCL All Stars with 2 wins, Team Bitraxual with 1 win & 1 loss and Team Colorado with 2 losses. On Sunday, February 18th the opening bout featured My Little Ponies winning handily over Team Bitraxual. The second game featured a nail biter with the RDCL All Stars and the Atom All Stars where, in the closest bout of the tournament, the fans were literally chanting “One more jam!”. The Atom All Stars were able to pull the win with a score of 148-140. Team Colorado then played The Rejects in the third bout of the day, with The Rejects winning by more than 100 points. In the Consolation bout, the RDCL All Stars battled Team Bitraxual for third place. Although Team Bitraxual’s teamwork was tighter than the previous day, it wasn’t enough to beat the RDCL All Stars. In the final game, My Little Ponies and the Atom All Stars gave it their all for 60 minutes. Both teams proved that a combination of super-talented flat track skaters and banked-track veterans is critical to win this tournament. In the end, My Little Ponies ran away with the tournament championship 181-123. The tournament brought a spotlight to several talented athletes, all from My Little Ponies. Blaque Jac won MVP Blocker and Crowe won MVP jammer. Tournament MVP was Erin Jackson who dumbfounded just about everyone with her incredible speed and agility. We can’t wait for next year! Save the date: January 16-17, 2016.